Kalpana Raghavendar, is an Indian playback singer who sung in telugu and tamil movies for more than 1000 songs. She is daughter of Singer T. S. Raghavendra and winner of 2010 Star Singer Season 5 television show conducted by Asianet channel. She is one of the contestant of Bigg Boss Telugu show in 2017, telecast in Star Maa. 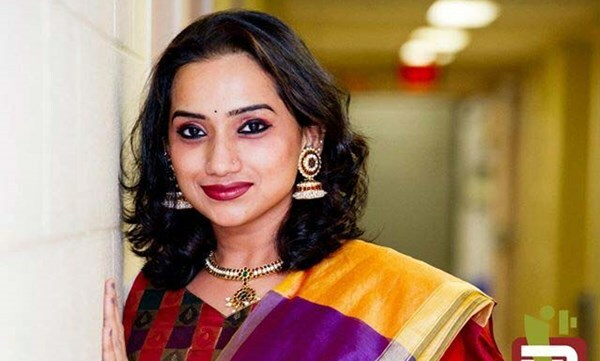 Check out below for Singer Kalpana Raghavendar Wiki, Biography, Age, Marriage, family, Husband, Songs List and more details. She was born in Chennai, Tamil Nadu in a musical family. Her parents T. S. Raghavendra (Father) is an prominent singer, actor and music composer in tamil cinema industry. Sulochana (Mother) is a singer in kollywood industry and crooned few songs and her sister Shekinath Shawn is a notable Opera Singer, she also known as Prasanna Raghavendar. With such musical interest since childhood, Kalpana professional trained her carnatic music session under her Guru Madurao T. Srinivasan. She is graduate in Masters of Computer Applications and doing her M. Phil degree. The personal details like her marriage, age, date of birth, college is not known, will update soon. She recorded her first song for a film at an age of 5 and later debut with the song Mangalagouriki frin Telugu movie Manoharam in 1999 for Mani Sharma. Being born and grew up in Chennai, Kalpana has worked in many telugu movies. She has worked with almost every leading music composers of South India including AR Rahman, Ilayaraja,KV Mahadevan, S.P. Balasubramanium and more. Even after singing many songs in Tamil and Telugu movies, She has participated in Idea Star Singer Season 5 Singing competition conducted by Malayalam Television Channel Asianet. She is crowned as title winner of the season. With the popularity she has garnered more oppurtunity in south indian movies. As per the source, She has sung for more than 1000 songs and performed in more than 3000+ stage shows across the globe. Kalpana is one of the 14 contestant of Bigg Boss Telugu game show which is host by Junior NTR. The reality show telecast in Star Maa. She is one among the senior and controversial contestant of the season.